" Fighter " follows the classic memory-loss JRPG trope. He cannot remember anything, expect he knows how to fight in battles and quickly gains the nickname " Fighter " by his friends. Fighter is loyal, kind, and protective and grew up in a orphanage and spent most of his life training to be in the royal army. Fighter is 18 years old when the game begins. Fighter never regains his memories, though he later becomes the legendary " Light Warrior ", still searching for his lost past and his true identity. Despite his enigmatic appearance, the Black Mage is the most friendly and welcoming of the bunch and was the first to offer friendship to Fighter. Most people avoid this poor soul as they fear his dark magical abilities. Though, this odd fellow could care less. He loves the negative attention as he finds it amusing and silly, and loves to see who's quick to judge based on their appearance. Black Mage has a cute kitten at home named Mog, who he really misses while on the journey. Black Mage is 20 years old when the game begins. 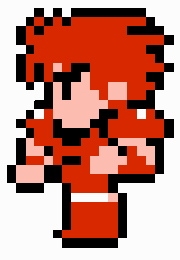 White Mage is a young boy and the youngest of the group, though he's admired for his yearning to help others in need, his intelligence, and his healing magic. White Mage is sometimes mistaken as a girl by strangers, though he doesn't mind. White Mage is shy, and hardly speaks, but he's alright with being a follower and trusts Fighter's leadership. White Mage is 14 years old when the game begins. White later on becomes a noble and brave adult. The oldest of the group, though not the most experienced at life. Red originally grew up wanting to be a doctor because his parents ordered him to do so, but at heart, he wanted to study the dark arts, knowing that society frowns upon dark magic he still wanted to become a Black Mage. Red now has the power to hurt and heal monsters, but at heart, he's a confused man. Red for a while quit magic from the stress of wanting to please society and please himself and picked up a fashion store for a while, selling fancy hats. Red left his store after befriending Black Mage and White Mage, and learns that he's not alone in struggling to find out who he is in later befriending Fighter. Red is 30 years old when the game starts. If you don't take him along, Red stays at Black Mage's house to take care of his cat. Red feels later on that his struggles can become his strengths, and becomes a deadly wizard- talented in healing magic and dark arts. Monk grew up with his Grandfather who taught him everything that he needs to know. Though, he's lonely, awkward and doesn't know how to deal with people. Monk struggles to make friends, and doesn't feel like he belongs with the others inside, and is envious of Fighter and how others look up to him as a role model. Monk wants that to be him. Monk wants to be the one that everybody loves. Monk feels the most confident in battle, because he feels admired for once. Monk is 19 years old when the game starts. Monk later gets his dream, when he later becomes a heroic Monk Master. Thief was once upon a time a wanted criminal, though she quickly became friends with Fighter and now she only steals for good in a Robin Hood sense of style. She hides her gender, feeling that it would be more safe if she was mistaken as a man. She's 18 years old. What are your headcanons with the classic Final Fantasy I heroes ? Warrior - Squire from a kingdom tasked to to restore the crystal, the Knight he served scoffed at it and so the Squire stole the crystal and took his place. White Mage - Holy Order who guards the Crystals, it is they who tasked the various kingdoms to send their champions to restore the crystal. White Mage is an apprentice who was foreseen by prophecy to be the one to restore the crystal. Black Mage - From an order of dark forces who wish to use the crystals power for their own gains in arcane knowledge, they sent one of their own to restore the crystal so they may all benefit from it's power. Thief - Stole the crystal from a warrior tasked to restore them, thinking it only a trinket, they take it to the meeting place in the guise of the man they stole it from and instead get swept up in the quest instead of a reward. Monk - A man filled with turmoil who took refuge with the monks to calm his heart, the journey of the crystal is given to him in order to complete his training. Red Mage - An adventurer and world traveler who comes across a warrior summoned to deliver the crystal and restore it. The two are attacked by monsters and the hero falls, but tasks the Red Mage to complete the journey for him. Having nothing better to do, they go along.